NECA has updated their Twitter profile pic to tease a new figure. 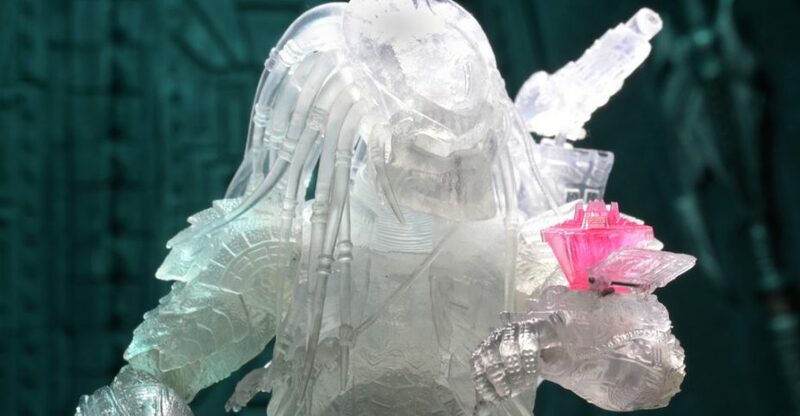 The image shows off a clear Stealth Alien vs Predator Masked Scar Predator. The figure is holding a hologram of the Temple. This figure may be a San Diego Comic-Con 2016 Exclusive, as they have said we may see an exclusive this week. We’ll update with more images and info as it becomes available. 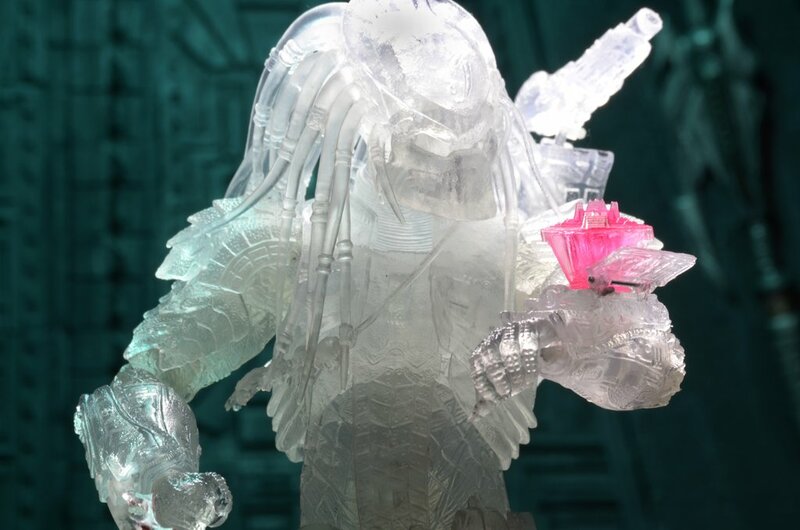 NECA has revealed that the Cloaked Scar Predator with Temple Hologram is indeed a San Diego Comic-Con 2016 Exclusive. They have shared better images, and we’ve added them to the story. See the teasers by reading on. Jesus wept, NECA are killing me. I'm fine with this being an exclusive. That pink temple hologram looks like a rose growing out of his arm, lol. BTW, I just picked up the regular version of Masked Scar yesterday, and this figure is awesome. I'm glad I skipped the unmasked version and waited for this one. 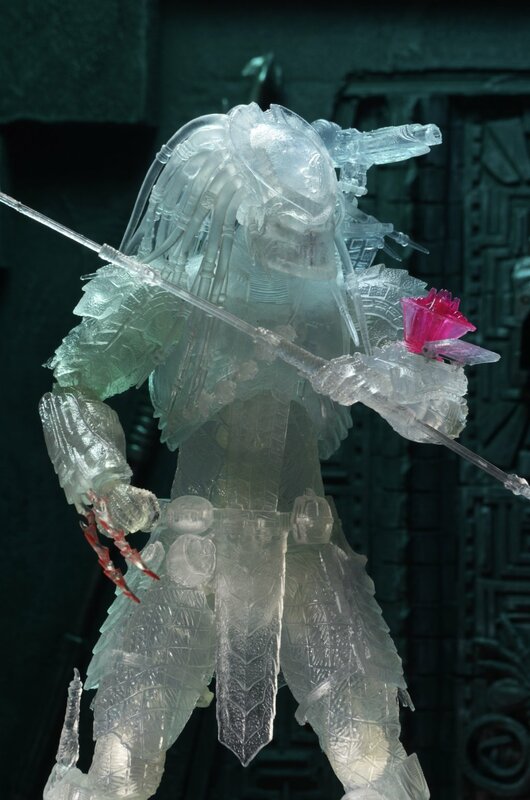 The hologram is removable, and able to attach to other NECA Predator figures. That's actually a plus for me. Not a fan of translucent Preds but I like the bloody blades and the hologram being removable and can be used on others ... auto purchase. I may buy 2 just to remove the hologram off one for another. The bloody blades sold it for me. Is it just a good photo or have they improved the clear plastic over previous releases I wonder? Probably just good photography. I don't really see how they could do much to improve the clearness of the figure without getting rid of all articulation or going totally hollow which would make the figure super fragile. I guess we'll have to wait to find out. I will probably see if Hastings will have them this year and at least go take a look at him in person but I have never really cared for the clear figures. NOW Glow in the Dark, that is a whole different story!! I only recently got into collecting NECA figures. For the past 20 years (2 the year exactly) I just been getting Transformers full time with some Gijoe, Star Wars, & Super Heroes thrown in. I will probably see if Hastings will have them this year and at least go take a look at him in person but I have never really cared for the clear figures. Randy has already confirmed that what happened last year with Toys R Us and Hastings getting a small amount of the SDCC exclusives was a one time deal. I'm not sure on the exact details or reasons but apparently it isn't worth doing again this year so if you aren't going to the convention then online is it for getting these.